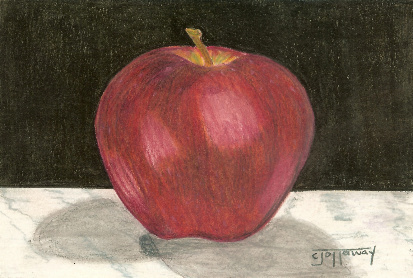 And so I drew another apple. This is from a tutorial that I found on the internet. But I used my own reference so I could call this my very own. My drawing is wonky and highlights and shadows are off, but I like how this turned out. I have been in the world of black and white too long, it was so nice to play with my colors. I wanted to do a couple of paintings this week, but my acrylics bit the dust. They were cheap artist acrylics. So I guess I got what I paid for. I am going to bite the bullet and save up for Fluid acrylics. I love to paint. I am still at the hobby/learning/screwing up/pissed off/crying for my mommy/screwing up again stage and I hate to spend so much money on supplies, but what other artists say is true. If you use poor quality materials, you get poor results. And even though a lot of what I do is not up to par, atleast using good quality supplies makes it alot easier to learn. In the meantime, my colored pencils came to the rescue and lifted my spirits immensely. I think I am going to sign up for an art class on line in lieu of taking art class at PFAC. I really liked my art class, but I don’t think she really has time to devote to her students. I’m a little disappointed, she is really talented and the class started out with a bang but ended in a fizzle. It is such a shame I could and wanted to learn alot from her. I still don’t know about the on line classes yet? I have to do some background research on the instructor. FYI (from my last post) – Drafting film hates solvent, it takes the color completely off the film. So it would probably make a great eraser. My remote and a tulip. Red Delicious? Enjoyment should be the biggest aim in art for most of us and that means materials that make it a joy too. You are worth it and they go a long ways anyhow. It’s just expensive getting started.